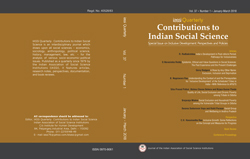 IASSI Quarterly: Contributions to Indian Social Science is a peer-reviewed quarterly journal of the Indian Association of Social Science Institutions (IASSI). The IASSI Quarterly is an interdisciplinary publication of theoretical and empirical research in the social sciences. It draws upon all social sciences--- economics, sociology, anthropology, political science, history, management, law, etc. ---- for the analysis of various socio-economic-political issues. The 19th Annual Conference of the Indian Association of Social Science Institutions (IASSI) was held during 11-13 January 2019 at the National Institute of Rural Development & Panchayati Raj (NIRD & PR), Hyderabad, India. The overall theme for the 19th Annual Conference was Development and Change.